Today in Masonic History Alvin Morell Bentley passes away in 1969. 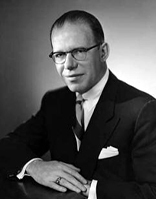 Alvin Morell Bentley was an American politician. Bentley was born in Portland, Maine on August 30th, 1918. He was born just three months before his father died serving in World War I in France. Despite losing his father, Bentley was well taken care of by a large inheritance he received from his grandfather. He would graduate from Southern Pines High School in Southern Pines, South Carolina. From there he would attend Asheville Prep School. He would graduate from the University of Michigan in 1940 with a bachelor's degree. After college, Bentley would first attend the Turner's Diplomatic school in Washington, D.C. to qualify for the United States diplomatic service. He would serve as vice consul and secretary for the Foreign Service starting in 1942 in Mexico. He would go on to serve in Columbia, Hungary, and Italy consecutively. He would end his time in the Foreign Service in 1950 taking a post with the State Department in Washington, D.C. That same year he would resign from his post when he disagreed with the foreign policy of President Harry S. Truman. In 1952, Bentley was elected to the United States House of Representatives from Michigan. He would serve in the House of Representatives until 1960, when he would run, unsuccessfully, for a United States Senate seat. While in Congress, Bentley was one of five representatives who were shot on the floor of the House in 1954. Referred to as the United States Capitol shooting incident, four Puerto Rican nationalists opened fire from the visitor's balcony. Bentley was shot in the chest and survived his wounds. After leaving Congress, Bentley continued in public service through various appointments to education related positions. He would also return to the University of Michigan to work on his Master's Degree. In 1966, while still pursuing his Master's Degree, then Governor George W. Romney appointed Bentley to the board of regents for the University of Michigan. Bentley would pass away on April 10th, 1969 while on vacation in Arizona. He would pass away from an "inflammation affecting the central nervous system". This was after surgery to correct the problem had put him in a wheelchair two years before. Bentley was a member of Owosso Lodge No. 81 in Owosso, Michigan.